I’ve never been the one to make a new cosplay every other week. I don’t have the resources nor the time to devote every spare moment to cosplay, and I like to give all my cosplays the attention they deserve. I never want to make a cosplay just to wear it once and hide it in my closet forever. So I may not have the most extensive list of cosplays, but I want to make sure I get all the use I can out of each and every one of them. That’s why it was a whole two years before I made my second cosplay, debuted at Anime Expo 2013. Hetalia sparked a love of history in me; two episodes featured the War of Austrian Succession, and Austria’s leader at the time, Maria Theresa. Now, I’m not going to go into a history rant (because believe me, I won’t stop), but if you feel like taking the time to read up on her, you won’t be disappointed; she’s one of my favorite historical figures, because she is BADASS. Anyway, I’m here to talk about cosplay, so let’s get right to it! 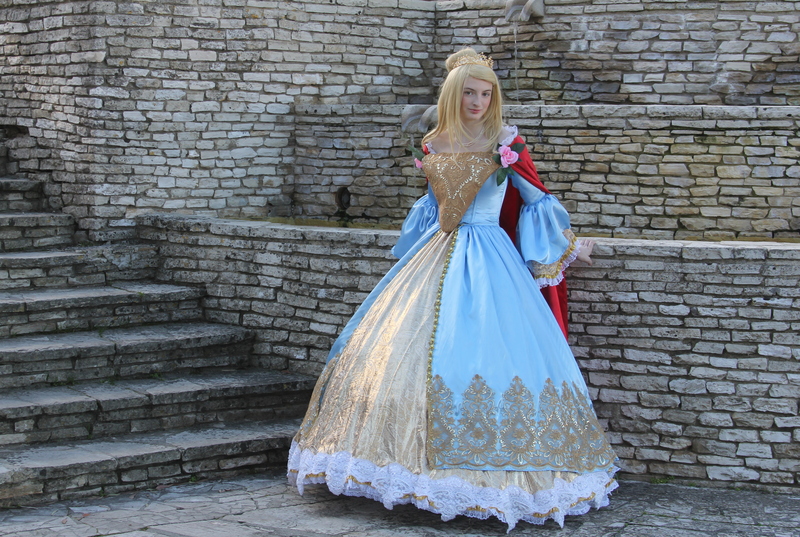 I did a lot of sewing for my friends between making Hungary and Maria Theresa (you can see some of them in the video from the first Cosplay Highlights), but this was my first really ambitious costume. 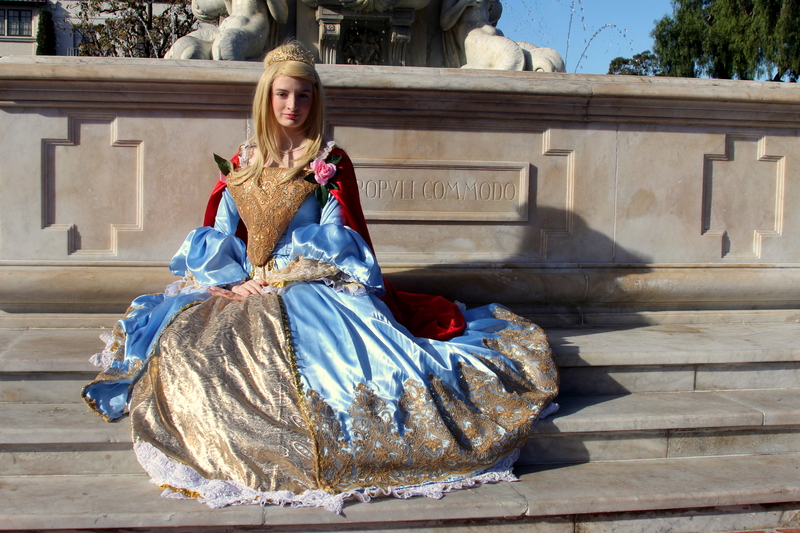 I designed it myself, taking inspiration from not only her appearance in Hetalia, but from actual paintings of her. My favorite is one by Andreas Møller around the time she was 11, although I looked at quite a few portraits and took pieces from here and there. 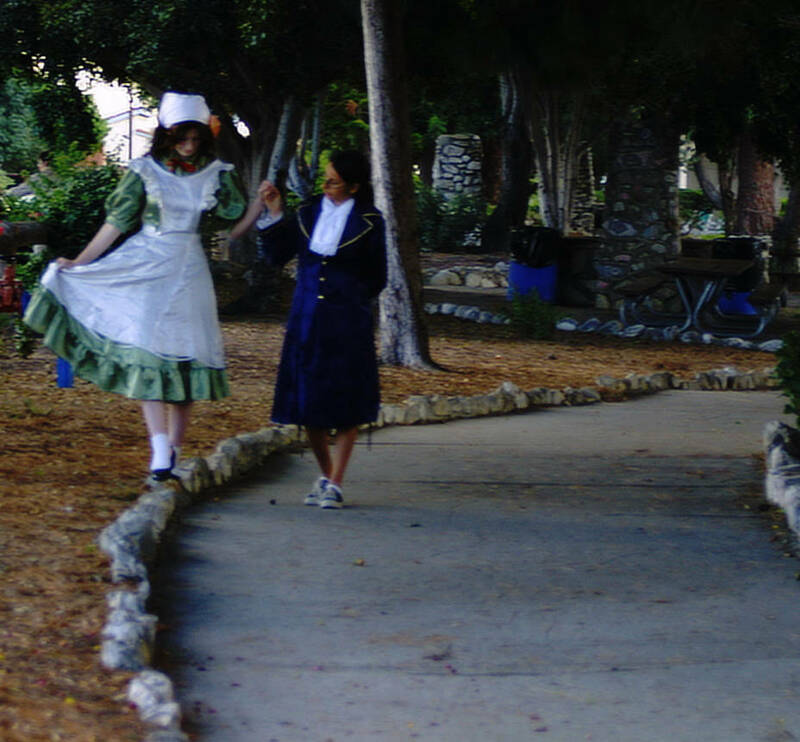 Everything about this costume was an adventure, because I had no experience actually making period costumes before this. Still in the height of my shiny fabric obsession, I bought a light blue satin at the fashion district and used a gold lamé fabric that I think someone had given me at some point. The cape is made from a thin crushed velvet also from the fashion district. The real eyecatching part of Maria’s costume is all the trim; there’s five different kinds in total. The beaded netting on the bottom of the skirt’s outer layer is the same fabric as the center of the bodice. I didn’t get enough of the white beaded trim on the under layer, but no one has ever noticed the gap in the back! On the other hand, I STILL have a ton of the gold an white lace that adorns the very bottom of the hem and the edges of the sleeves; it came in a huge bulk bag that I underestimated the quantity of. Another white lace is along the neckline of the cape. I think my favorite, however, is the gold bead trim that runs up the length of the skirt on the front. All of the trim was sewn on by hand, and I swear I thought I would never be done… I’ve never had a lot of patience, especially when it comes to hand sewing. This costume was my first foray into patterning anything myself. While the majority of it was cobbled together from about 3 different commercial patterns, I did the cape and the first version of the bodice. I say first version, because I actually changed some things after my first time using the costume. Initially, I had it lace up the front, and I made a triangular piece (affectionately nicknamed the Dorito) to cover up the laces. I later scrapped the Dorito, instead favoring a back zipper because the front just looked too bulky the way I originally made it. Everything is attached by snaps; I was intimidated by the fact that this was my first heavy cosplay, so it’s all separate pieces. The skirt snaps onto the bodice at the waistband, and the cape snaps on at the shoulders. That’s actually one reason for the roses I put on the front: it’s not only a nod to the Møller painting, but they hide the point where the cape attaches to the dress. Maria’s accessories came from all over, a lot I bought online. Above all else, I wanted to make sure I had a fan: with how hot it gets at Anime Expo, I knew I was going to die. It may only provide marginal relief from the heat, but I wanted whatever I could get. Plus, it makes a nice prop for photos! Her shoes came from David’s Bridal, after a looong search trying to find ones I liked. They may not be period accurate, but they were reasonably priced, and I could get them dyed to match my dress for free. The crown I used for her was one I bought at the Renaissance Faire in middle school, and first used as Queen Elizabeth I during my school’s “History Day”. Again not period accurate, but it matched the floral details that I wanted to highlight. Now, Her wig gets its own paragraph. It’s a generic wig that I bought online, but this wig is a trooper. Of all the times I’ve worn it, for multiple cosplays, I have never had to replace it. I’ve styled it up, down, and all over, and 6 years later there’s hardly any frizz or shedding at all. I find that generic wigs can be very hit or miss, but this one has stood up better than some name brand wigs I’ve owned. Of course, being so long ago I can’t find it again, but I have never been more impressed with a generic wig. Debuting Maria Theresa was overwhelming. I’m lucky I had one of my best friends with me, cosplaying Frederick the Great. (Anyone notice our matching trim?) For some reason, we have a habit of picking characters who hate each other or have some sort of rivalry going on… But that’s beside the point. We weren’t entirely prepared by how much attention we would get with big costumes; it took us HALF AN HOUR just to cross the convention center lobby, and while I am flattered by such attention, the end of the day had us finding any route we could to avoid the lobby, just to be able to get anywhere on time. It. Was. HOT. 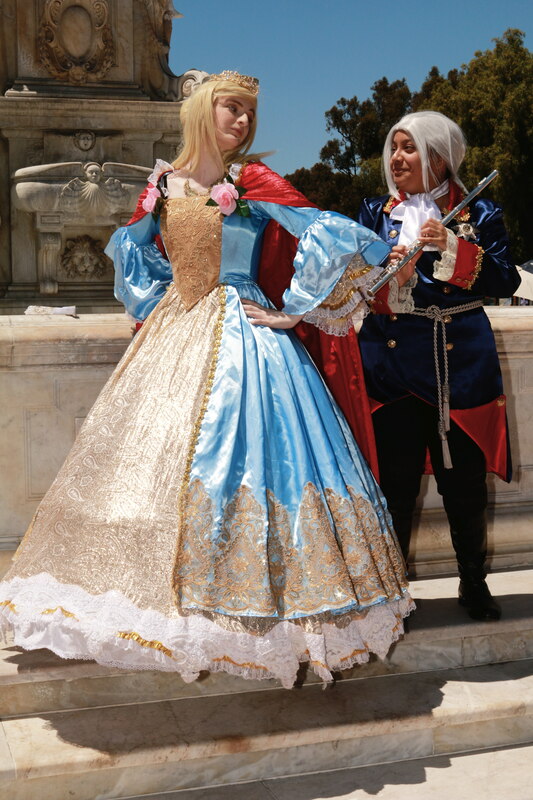 I knew what I was getting into, but I just about melted, especially with Anime Expo having moved all of their cosplay gathering sites outdoors. Despite my best efforts to use lightweight fabrics, to try and make the heat and the weight tolerable, it was still… So… HOT. However, it did provide a learning experience; I still carried a con bag, and found it very easy to stow things underneath my enormous skirt whenever we got stopped for photos. At one point, I considered sewing pockets into my hoop skirt to be able to store things, but then I realized I’d have to reach UP my skirt for anything throughout the day… Not very ladylike, right? Another issue I quickly found was that people stepped on me SO MUCH. As Hungary, I never had a problem being stepped on unless I was sitting or laying down somewhere, and even then, it was nothing like the hell Maria went through. I tried to keep from taking up an obscene amount of space, I really did. 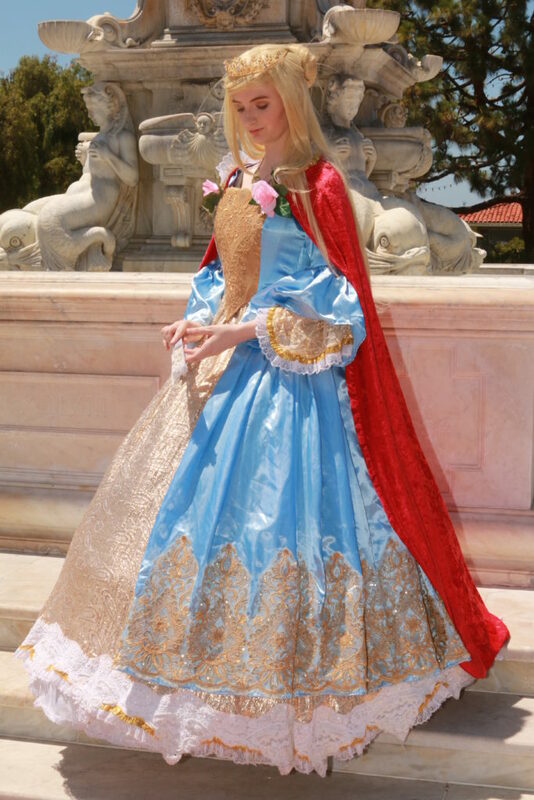 My hem barely skimmed the floor, and I shortened her cape from the long coronation style from the anime. I knew it would be a problem, and I tried my best to stop it. But as I quickly found out, it did absolutely no good. By the end of the con, I had pieces of lace that needed replacing, and a whole section at the side of my skirt where it had been torn from the waistband. All because it had been stepped on by me, my friends, and everyone else in attendance. Also a new experience was being mistaken for other characters… A LOT. 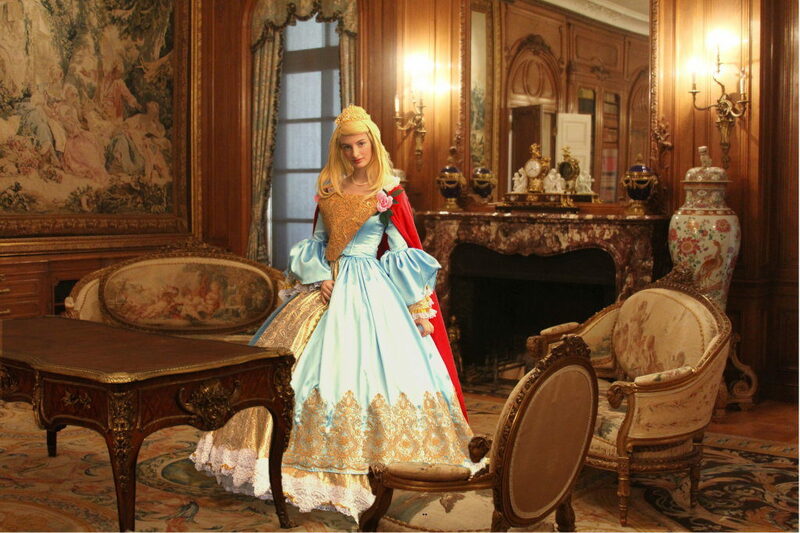 I can’t tell you how many times I got called Cinderella, or had people assume I was just “a princess”. 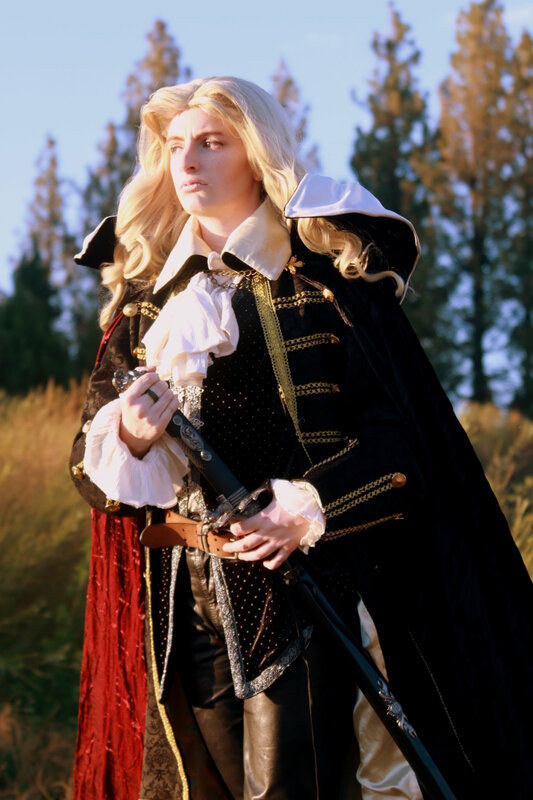 Even among the Hetalians, a disappointing number of people thought I was a female version of France (although I did use the wig for fem France eventually… Off topic). Even so, it made all the sweeter when someone DID recognize us. I distinctly remember finding a full group of Austrian Succession cosplayers once, and I swear I didn’t ever want to let them go. My babiiiiieeeeesssss!!! Sorry, my fangirl is starting to show, isn’t it? Even despite the general populace not knowing who I was, it felt amazing to be Maria Theresa. I felt regal, I felt powerful, and I only hope I did justice to the great woman she was. I got so obsessed with Austrian history, especially the Habsburgs, I had to learn everything about her. My friend and I even went to Vienna in 2017, and I’m certain by the end of our week and a half trip she was tired of hearing me babbling like the rabid fangirl I am. And no, I didn’t take my costume to Europe with me… I didn’t want anyone to think I was trying to make fun, and I certainly did NOT want to wrestle a hoop skirt into my luggage. I haven’t worn Maria Theresa in quite some time. As I said in my first Cosplay Highlights, it’s been a while since I’ve had the opportunity to do anything Hetalia related. That’s not to say I’ve left the fandom or given up on cosplaying her, it’s just that it’s a fandom on the back burner for now. 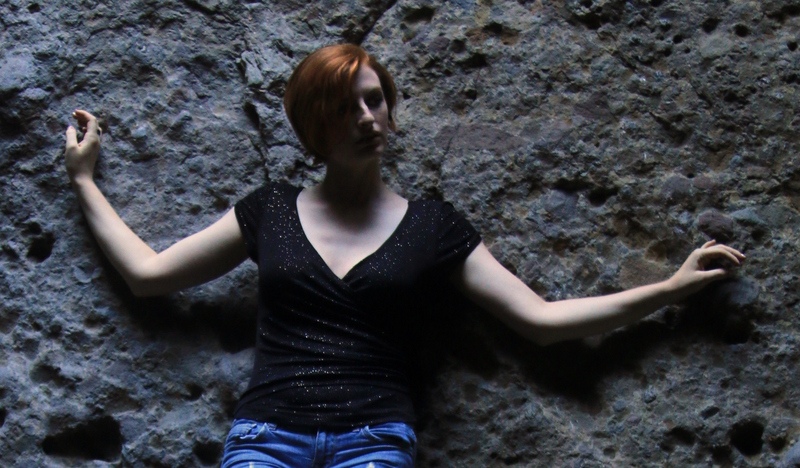 For a while, I’ve actually toyed with the idea of completely remaking this one. My skills have improved greatly since 2013, and it’s always been in the back of my mind that I could do it better, more period accurate. I know so much more now, and I feel like it would be interesting to just physically see the improvement. Like how artists take a piece they did years ago and redraw them. The main obstacle to doing that, however, is time and money. It was an expensive enough project the first time, and if I expect to use higher quality materials, it would be a lot of resources committed that I just don’t have right now. On top of that, I would want to be able to wear it out; I don’t have any events on the horizon for her, and I don’t want to commit to doing it if she’s just going to sit in my closet. Maybe someday, but for now that’s just wishful thinking. What do you guys think? Would you be interested in seeing a new and improved version of this one? Next post: Hi, Have We Met? Copyright © 2019	Jennifer Lidikay - Images Pro Photography. All rights reserved.